Burn arrived in Melbourne in 1853 and was to depict the growing city and surrounding districts. 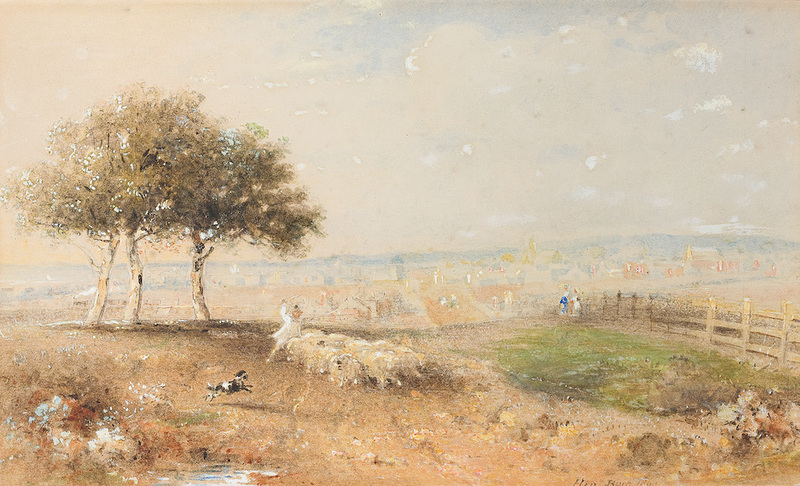 Bay St Brighton has a beautiful luminous quality, the incidental elements of the herding sheep provoking an atmosphere of reminiscence and providing a narrative element against the details of the landscape. Burn’s many asethical appealing views of Melbourne, are of historical interest, capturing well-known areas of Melbourne and its surrounds. Here, Bay St Brighton depicts a train, in the middle ground, on the newly opened railway line, which, from 1859, ran from Melbourne to Brighton.